We’re spoilt for choice when it comes to home gym benches, but as you have managed to narrow it down to these two you’ve done well. 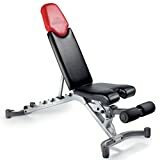 The Ironmaster super bench and the Xmark 7630 are the best adjustable benches under $350 right now. The Ironmaster super bench is fast becoming one of the most popular weight benches for serious lifters out there, and with the tank of a bench the Xmark 7630 close on its tail, it’s going to be a tough call as to which of these two excellent benches is best for your home gym. I’ll also take a look at some of the excellent attachments Ironmaster offer for their bench and include a couple of videos so you can have a closer look at these two titans of the home gym. Designed primarily to be versatile this bench works extremely well as a flat bench, which often isn’t the case with adjustable benches. I know from the past I had to buy a separate flat bench because the adjustable bench I bought was too high from pad to floor for any decent foot placement and it was disturbing my pressing power. 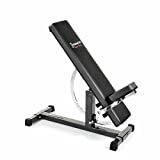 The height from pad to floor of the Ironmaster is about 20″ which isn’t bad, it’s around 2 inches less than most adjustable benches, but it’s still not perfect, we like to see around 17-18″. 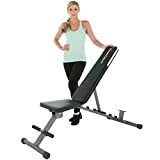 Another reason this bench works well as a flat bench is the design of the seat, the fact that it attaches separately means you can start out with a flat bench and only add the seat when you want to use the bench for incline workouts. Being able to detach the seat eliminates that annoying gap you get with adjustable benches, but by solving one problem you create another and it’s because of the seat design that this bench can only handle 600lb in incline positions compared to the 1000lb capacity when flat. It’s great to see all four corners of the frame making contact with the floor, this design is slightly more stable than the tripod design, especially in the higher incline positions. Fairly light at 67lb making the bench easier to move around your floor space, the super bench also has transport wheels integrated into the rear stabilizers. Xmark – The simple design of this bench is what sells it for me, nothing fancy, just a tough, rugged, practical bench for your upper body workouts. Designed for utmost stability, the wide front and rear stabilizers ensure this bench makes contact with the ground on all four corners. Skid-resistant rubber feet aids stability allowing you to use this bench on polished surfaces. We also prefer the ladder type adjustment system used with 7630. Ladder adjustment systems have always seemed a more stable design than the pin locking type plus the ladder is very fast to adjust. This bench has been designed to take some serious poundage with its 1500lb capacity in flat and incline and I doubt anyone is going outgrow this bench any time soon. No attachments are available for the 7630 bench. The Ironmaster is by far the most versatile weight bench I have come across, it has 11 adjustable positions 0º, 5º, 10º, 20º, 30º, 40º, 50º, 60º, 70º, 80º, and 85º and the same in decline, don’t quite know why you need that many decline positions but hey it’s nice to have the options. You also have the detachable seat which sits at the perfect angle to give you enough support in incline. 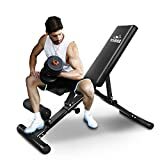 Xmarks XM7630 doesn’t quite match the number of adjustment angles as the Ironmaster but with 5 adjustment angles for incline 20 35 50 65 85 including flat and a -20 in decline plus the three adjustment angles of the seat, this bench has got you covered for all your upper body workouts. Ironmaster – The Ironmaster is solid in all positions and surprisingly it’s very solid in incline which I was happy to see. I’ve trained with my friend on his Ironmaster bench a few times last year and it’s as solid as anything you’ll find at a local gym. I wouldn’t have guessed the super bench to be so stable especially as most of the weight is pivoted on the central post, and because of this you would expect there to be some play with the back pad but there was none. The main frame is made from 11 gauge steel and the rest is 12-14 gauge, the whole frame is powder coated to resist scratches and rust. There’s a high quality feel to this bench with its chromed parts and vinyl upholstery, I don’t think you will have many complaints when you get one home and set it up. As we touched on earlier, the seat is only capable of taking 600lb combined weight, remember this includes your own weight. The seat’s low weight capacity might be a deciding factor for some of the more seasoned weightlifters but it seems this is the only real chink in the armor I can find with the bench. The attachments are of similar quality to the main bench but are a little pricey. From the many many reviews on this bench, there have been no complaints about the upholstery which is made from heavy-duty vinyl and should last. Xmark Xm – This thing is a home gym bench at its best, the build quality on show is awesome, built from 11 gauge 2 x 3 heavy-duty steel, extra thick 3″ high-quality Duracraft padding covered in sweat and tear resistant Duraguard vinyl, you won’t beat this bench on quality and durability. Xmark offers a lifetime guarantee on the frame to back this up. All I have seen is fantastic reviews for this bench. If you’re reading this comparison and thinking both of the benches sound a little out of your league I’m never going to get anywhere near lifting that kind of weight, hold on! What you need to think of first and what lots of people seem to forget when they buy home gym equipment is leaving room for growth, even over a relatively short period of time, such as a year of training hard, you’re going to put on a lot of muscle mass, you will weigh more and you’ll lift heavier, this is why it’s always a good idea to buy a bench with a higher weight capacity. With higher capacity benches you almost always have better quality and with quality comes durability, all 3 of these things are very important when it comes to buying a bench. There’s no pinot buying a cheap bench if you take your lifting seriously, the welds break, they wobble and they have low capacities that you outgrow easily and then you’ll be looking at buying a better bench. Not everyone has the funds to buy a $3oo bench like Xm 7630 and if you haven’t and you need something to start you off, go with a brand you can trust like Bowflex. You may get a low weight capacity but their budget benches like the 3.1 come with long frame guarantees and they are great quality for the price. Easy to sell on too when you’ve outgrown them because people trust the name plus you’re still able to sell it on with some warranty.